High Drug Prices Debated At Senate Hearing : Shots - Health News Senators called pharmaceutical industry leaders to account for the high costs of medicine during a Senate hearing. The executives deflected blame to insurance companies and middlemen. 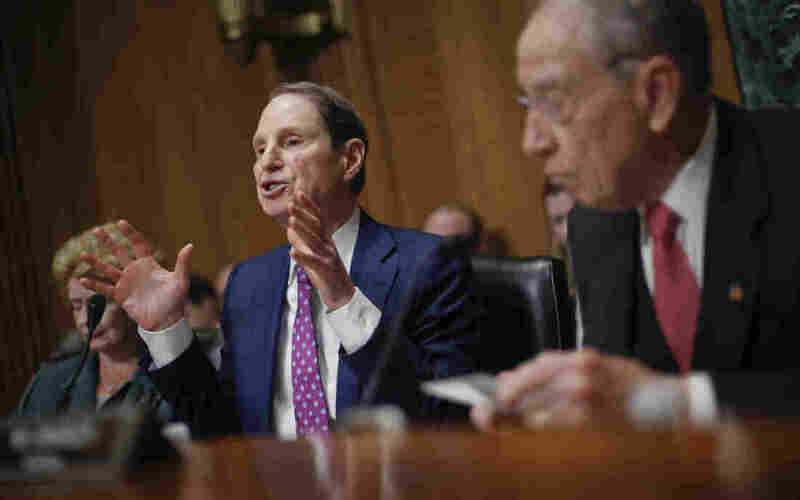 Sen. Ron Wyden, D-Ore., left, and Sen. Chuck Grassley, R-Iowa, right, chairman of the Senate Finance Committee, asked drug company CEOs some tough questions about drug prices on Tuesday during a hearing before the Senate Finance Committee. They each acknowledged briefly that they have some role to play in helping lower drug prices. But they defended their industry by touting their multibillion-dollar investments in research and development and praising advances in treatments for cancer, hepatitis C, schizophrenia and autoimmune diseases. "Last year, Janssen invested $8.4 billion globally in research and development, making Janssen one of the top research and development investors in any industry anywhere in the world," said Jennifer Taubert, worldwide chairman of pharmaceuticals for Johnson & Johnson, which owns Janssen. The drug industry leaders also pointed out that the list prices they set for drugs are not what they are actually paid by insurance companies or pharmacy benefit managers, the middlemen that negotiate discounts and rebates on behalf of employers or insurers, which include companies like CVS Caremark and Express Scripts. "We want these rebates, which lower net prices, to benefit patients," said Olivier Brandicourt, CEO of Sanofi, which makes Lantus, one of the highest priced brands of insulin, whose list price has risen from $244 to $431 since 2013, according to the committee. According to investment research firm SSR Health, the net price of Lantus has declined 28 percent over the last two years because of those discounts and rebates. "Addressing list prices alone will not be sufficient for solving the problem of patients' out-of-pocket costs," Brandicourt said. But the Senators had little patience for those arguments. "For a patient taking a drug that has no competition, the list price becomes very important," said Sen. Chuck Grassley, R-Iowa, the committee's chairman. "I've heard about people skipping doses of their prescription drugs to make them last until the next paycheck." Many patients have to pay the full price for a prescription drug until they meet their deductible, and others have payments that are calculated as a percentage of the list price. So higher list prices often translate to higher costs at the pharmacy counter, even when pharmacy benefit managers and insurers have negotiated discounts. Several of the drug company leaders said they support a Trump administration proposal to change the current system in which drug prices are set using secret rebates negotiated by pharmacy benefit managers. The change would make those rebates illegal and force pharmacy benefit managers to instead negotiate discounts upfront so that people will get the discounts at the pharmacy counter even if they haven't yet met their deductible. Several of the CEOs, under pressure from Grassley, said they would lower their list prices if that proposal is finalized and the rule applied to both government and commercial prescription drug plans. "It is our very clear intention that we will not keep a single dollar from these rebates. We will try to move every single penny to the patients," said Albert Bourla, CEO of Pfizer. Taubert of Johnson & Johnson said the company's final price would depend on whether additional fees were imposed by pharmacy benefit managers. However, they said they don't want to see the government negotiating drug prices directly through Medicare, a proposal that has been brought forward by Democrats and was originally embraced by President Trump. "The government should not directly control the price of medicines either through federal government price controls or worse, outsourcing prices to other countries," Brandicourt said. Even as the companies protest that the high list prices of their products don't reflect what they actually make on those products, drugmakers have consistently enjoyed some of the highest profit margins of any industry. Pharmaceutical manufacturers' profit margins have exceeded 26 percent for the last three years and 22 percent for the past 10 years, according to a presentation by CVS Health that cited Macrotrends.net as its source. The company executives were not supportive of another Trump proposal to tie the price that Medicare pays for drugs to the prices paid in other developed countries. "We need an American solution to this American challenge," said Taubert of Johnson & Johnson's Janssen unit. "You've got a double standard," Wyden said. "You're willing to sit by and hose the American consumer and give the breaks to people overseas." Gonzalez acknowledged that the company makes a profit in those countries, even with the lower prices, but warned of dire consequence if U.S. prices fell to those levels. "If a market the size of the U.S. were to collapse to the lower end of that pricing model, I can just tell you that AbbVie would not be able to invest in the level of R & D that it invests in today," Gonzalez said. In response to a question from Grassley, all the CEOs said they consider the risk of negative public opinion when they decide on their list prices. The Trump administration has proposed requiring companies to include their drugs' list prices in all their direct-to-consumer advertising, a plan the companies have resisted. They also said they consider the reaction of federal officials to their price announcements. "The federal government is a very key aspect of our deliberations," said Pascal Soriot of AstraZeneca, an answer echoed by all seven industry leaders.